A Hold is simply a segment of a movie where the motion is frozen. This is done with adjacent KeyFrame Markers that have the same value offset by the Hold period in the Timeline. 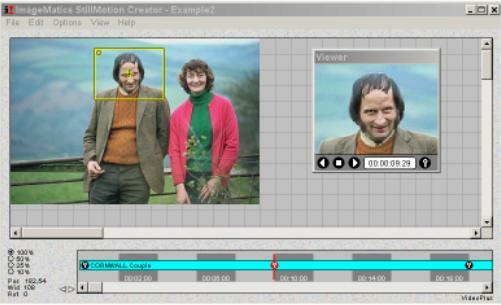 This example adds a two second Hold to the looping movie created in Example 2. Next we add two seconds to the end (zoom-in) segment since we shortened it by inserting the Hold two seconds in at the 12 second point. The files associated with this example may be downloaded by clicking on the download icon. The files are contained in a self extracting .exe so simply click on the downloaded file and the test files and resulting SWF file will be loaded into your selected directory. Click on the Download Icon to download the Example 3 files. Step 1 Figure 1 shows the screen at the end of Example 2. The Timeline shows middle KeyFrame Marker at ten seconds into the the movie. 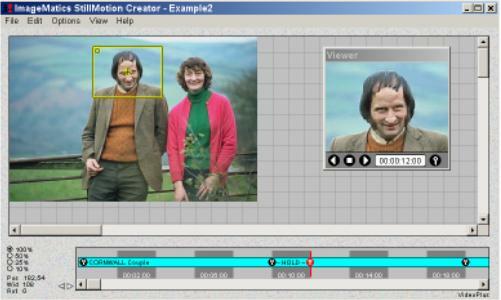 The start KeyFrame Marker was copied to the 20 second point in the Timeline to create a zoom-in / zoom-out effect with equal in and out times of ten seconds (see Example 2). 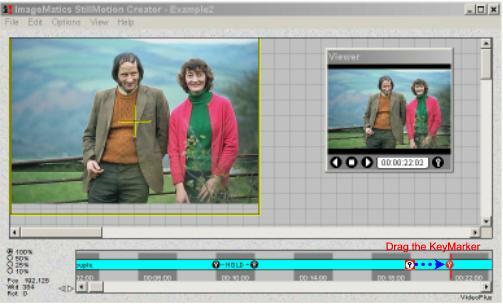 Step 2 To create the two second Hold a copy of the KeyFrame Marker is placed at the 12 second point on the Timeline. See Example 2 Step 2 for a review of Cut and Paste. • The insertion of the Hold or any Paste operation will not effected the position in the Timeline and the consequential timing of movie. The effect will shorten the next segment by the time of the insertion. Step 3 Because we want the zoom-in and zoom-out periods to be the same we must increase the duration of the final segment by moving the KeyFrame Marker two seconds further along the Timeline. This is done by moving the mouse cursor over the KeyFrame Marker and then dragging it to the desired position. • Dragging a KeyFrame Marker does not effect the position of any other Marker on the Timeline but will effect the timing of the adjacent segments. Figure 4 The Flash Movie made in the example, note the two second Hold Step 4 Preview the Movie using the Viewer Window's VCR-like controls. You will see the Movie zoom-in, freeze for two seconds and then zoom-out to its start. Create the Flash Movie as in Example 1 by Selecting the Make Flash SWF Movie entry under the File Menu. See Example 1 Step 4 for details. • The 22 second movie shown as Figure 4 requires only 27,746 bytes and is being displayed in 320 by 240 pixel resolution. The movie in Example 3 is two seconds shorter and is 27,709 bytes in size. The two second Hold only added 35 bytes to the file size!! Example 4 will show how to create an image rotation.